Vail is a great place to travel with kids. We've put together an ideal 5 Day itinerary for you and your family. Stay outside of town in the historic Camp Hale and take part in a number of guided activities including rafting, a jeep tour, atv tour, and hiking. We've offered a few kid-friendly dining and attraction suggestions right in Vail as well. You can Book this Itinerary as a Package. Camp Hale is located 15 miles outside of Vail, Colorado. This historic site was used for training the 10th Mountain Army Division in the winter months. Today it houses Nova Guides' lodge and cabins, and acts as starting grounds for their many guided activities. The cabins are great for families, offering full kitchens and multiple rooms. Spend 5 nights at Camp Hale to truly take advantage of the area's exciting adventures. Just a 30 minute drive from town, you can easily pop into Vail for dinner and other attractions. The easiest way to access the area and have the freedom to explore is with your own vehicle. If you are flying into Denver International Airport (2 hours from Vail) or the smaller but more expensive Vail Eagle County Airport, you can find car rentals at either airport. Depending on what time you arrive, you might want to stop in Edwards or Vail and stock up on some groceries for the week, especially breakfast and snacks. You will have a full kitchen at Camp Hale's Pando Cabins. If you want to dine out on your first day in the area, try Westside Café and reasonably priced. 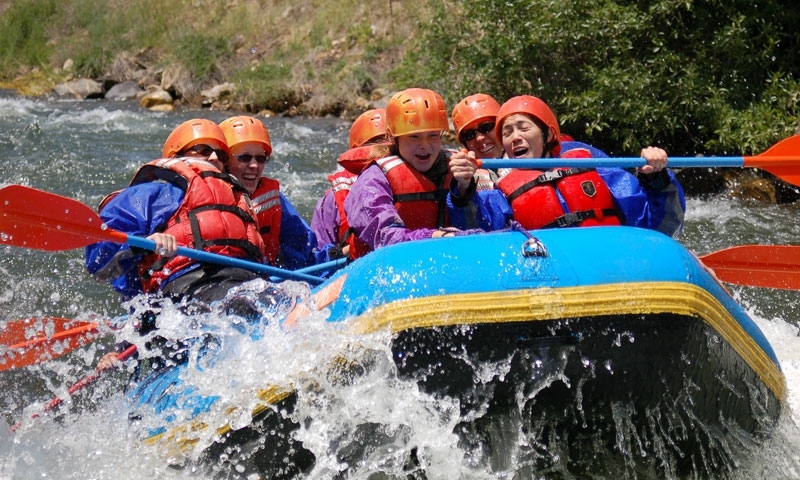 Your whitewater rafting adventure will take place on the Colorado, Eagle, or Arkansas River, all great rivers with rapids that range from I-IV depending on the section. Rafting includes lunch and your 6 hour adventure can be booked in the morning (9am-3pm) or afternoon (1-7:30pm). In the evening take some time to explore the historic Camp Hale and read interpretive signs just outside your front door. Either cook dinner in your fully stocked cabin kitchen or dine out at the delicious McAllister's Grill, right at the Camp Hale Lodge. Hop in an open-aired jeep with an experienced guide and explore the White River National Forest, right out of Camp Hale. Jeep Tours include lunch or a snack and last roughly 3 hours. Pick your starting time of 9am or 2pm so that you can enjoy an evening in the small mountain town of Leadville. If you need a break from the outdoors, head to the National Mining Hall of Fame. Or fish and hike around the pretty Twin Lakes. You can't go wrong with dinner at High Mountain Pies Pizza. Be in charge of your own ATV and cruise through the scenic White River National Forest. Your guide will show you the way. Tours include lunch or a snack. Start in the morning, midday or afternoon. In the evening head to Vail and explore the peaceful Betty Ford Alpine Gardens. Pay attention to some of the wildflowers so you can impress your guide on tomorrow's hike. Try Moe's Original BBQ or Blue Moose Pizza for dinner. Take a guided hike deep into the mountains with an experienced guide. Resolution Creek Trail and Yoder Gulch (a little more strenuous) are two great options. A guided hike includes lunch and will last from 9am to 1pm. Post-hike, head to Vail Resort and treat the kids to an afternoon at Adventure Ridge, Vail's activity center complete with mini-golf, a climbing wall, bungee trampoline, and lawn sports. Spend the evening strolling through Vail Village, grab a few souvenirs, and eat at the Bully Ranch Restaurant.